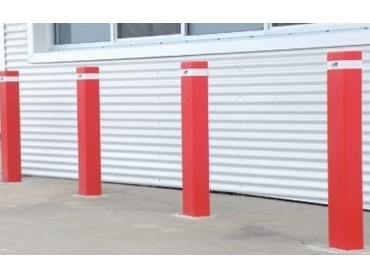 Centurian fixed below ground steel bollards from Barrier Security Products are designed for traffic control and property and asset protection applications, and are available in round or square designs. The Centurian C90BG fixed below ground bollard is designed for medium duty applications. Each post is 90mm diameter X 900mm high (plus 380mm in-ground) with a 5mm wall thickness, and weighs 12kgs. Manufactured from heavy wall mild steel tube with welded starter bars for installation into new concrete footings, these fixed below ground bollards are suitable for installation in asphalt or any soft surface requiring concrete footing. Centurian C90BG fixed below ground bollards are available with a hot dip galvanised finish or are hot dip galvanised with the option of a powder coat finish.